In print I am reading The Sleeping Beauty Killer by Mary Higgins Clark and Alafair Burke, book 4 in the Under Suspicion series. I love MHC. She is one of my all time favorites to read. I’m only a quarter of the way in but it’s a great read, as always. My kindle read is Incineration by Laura Disilverio, book 2 in the Incubation series. This is a YA dystopian book. I read book last year and loved it. I’m 41% into this one. Honestly, I found the beginning a little slow. But the premise is intriguing. The locusts are freakish! The Southland’s most mismatched set of siblings — flamboyant Mary Alice and prim and proper Patricia Anne — are back and ready to boogie in a King-sized story of hip-shaking mayhem and murder most tacky. 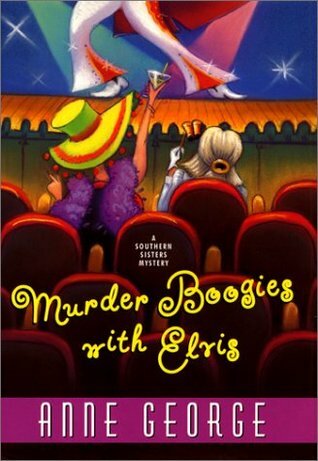 Murder Boogies with Elvis by Anne George, book 8 in the Southern Sisters series. I crack up just thinking about this book. Actually, all of the books in this series are just funny. Quick, easy reads centering around a pair of eccentric, “elderly”, sisters. I’m taking notes so when I’m their age I’ll know what to do. I think I will read, A Little Class on Murder by Carolyn G. Hart, book 5 in the Death in Demand series. I’m trying to finish the May Goodreads challenge in the Cozy group. I also just discovered Kindle in Motion books. Like I really needed this. So I will probably read The Mermaid by Jodi Picoult. It feeds my mermaid obsession! The Mermaid on the cover swims! ← Top 5 Tuesday- What 5 Books Would You Save From Fire?